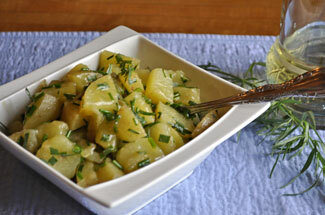 French Potato Salad, Thyme for Cooking easy summer side dish. This is a lightly dressed potato dish, with lots of tarragon and chives. In a medium bowl whisk olive oil, vinegar and stock. Add chives and tarragon and let sit to blend flavors while potatoes cook. Slice the potatoes for salad, in small, bite-size pieces. Heat a medium saucepan half full of water over medium high heat. When water is boiling, add potatoes and cook just until tender when pierced with a sharp knife, 10 - 12 minutes. Remove from heat and drain well. Let rest to absorb flavors, stirring gently occasionally, allowing to cool. Serve.